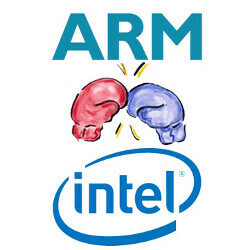 When we speak about mobile devices and their processors, ARM is the first and only name that will come to mind. Intel has started making its baby steps into mobile this year, but its presence is still hard to notice with only a couple of device running on Atom chips. Chipzilla is trying hard to change that, coming from behind in a very competitive space where ARM has managed to outplay it with a drastically more power-efficient architectures over the last couple of years. With the latest Atom chips Intel might have had the performance advantage, however it never managed to get power consumption down to competitive levels. Until now. An Intel engineer paid a visit to AnandTech bringing two cream of the crop devices, a Dell XPS 10 tablet based on Qualcomm’s Snapdragon S4 with Krait (dual-core, 28nm), and a Nexus 10 running on Cortex A15-based Exynos 5 Dual chip (dual-core, 32nm). Why? Simple, to prove that Intel has once and for good dealt with its power consumption issues. For that, power consumption of those devices was fared against Intel’s own solution, the Atom Z2760. The conclusions are very favorable for Intel. Atom is definitely faster than Krait (which alone is interesting given that Atom is a 5-year old architecture), but what’s even more exciting is that the two are nearly on par in terms of power consumption. Things will start getting interesting in around a year when Intel finally refreshes its Atom chips with a new 22nm Atom core. In the comparison with Cortex A15, Intel’s Atom loses in terms of performance. However, A15 is clearly not meant to deliver its full potential on smartphones - it’s way too power hungry. It would work fine on tablets, but on smartphones it’s no coincidence that ARM recommends using it in a big.LITTLE configuration with a more power efficient A7 that will take over with less intense tasks. To conclude, Anand makes an interesting suggestion. Intel’s Haswell architecture for desktop, a high-end solution costing tens of times the price of mobile solutions, is likely to receive a drastic power consumption makeover and could go down to the impressive 4W when we arrive at the 10nm manufacturing around 2017. That would open up the gates of heaven for mobile devices like say tablets. Moreover, it might be possible to get Core chips into smartphones even earlier than 2017. Intel would definitely need some high-profile devices to drive adoption and market share, but it seems like its hard work could finally start to pay out and ARM will feel the heat soon. Power efficient, yes. Best GPU, no. The Mali-T604 got very respectable scores compared to the PowerVR's when you factor in the insane screen resolution, and it trumps everything but the SGX554 in the offscreen test. Honestly, Google/Samsung should have used the Mali-T658 for such a high resolution, but I think Samsung wanted to keep that for the GS4. There no point in having powerful hardware for a restrictive mobile OS such as the aging iOS. Its a good thing that Apple has a large fan base to keep buying the same design same martyr years after years months after months. We were talking about the iPhone 5's GPU, the SGX543MP3, not the SGX554MP4. There's no doubt that the SGX554 beats out the Mali-T604, but the SGX543 certainly doesn't. GLBenchmark 2.5 - Egypt HD (Offscreen 1080p) iPad 4 (SGX554MP4) - 51.8 Nexus 10 (Mali-T604) - 32.9 iPhone 5 (SGX543MP3) - 27 Numbers. It's the Nexus 10's high resolution screen that brings it's score down, if you put the Mali-T604 with the same resolution as the iPhone 5, the numbers would be much higher. But, I know the SGX554 outclasses the Mali regardless of resolution. I don't thumb down, I just prove people wrong (when possible). dude it may be power efficient but definitely not the most powerful cpu nor the best graphics around....intel is going to flatten qualcomm and a6 alike! Maybe in a couple years, but not right now. Qualcomm isn't who Intel should be worrying about, it's Samsung. Samsung has always had best in class chips with its Exynos. Yeah, but Exynos are used only on Samsung's own devices. What Intel seeks is being the choice of HTC, Motorola, Nokia and Co. And lets not simply deny the A-chips are strong silicon too. Ah, I was looking from a pure performance standpoint. Forgot about the competition of being the choice chip for manufacturers. Half the reason why Apple's Ax chips are so strong is because Samsung manufactures them. If any other chip manufacturer made them, they probably wouldn't be as good. yes with best kernal exploit. iPhone 5 has the best GPU on phones, fact! iPad 4 has the best mobile GPU ever, fact! You have no clue on what you're talking about. GPU wise, Atom chips are downright pathetic compared to the best ARM chips right now: http://www.anandtech.com/show/6522/the-clover-trail-atom-z2760-review-acers-w510-tested/5 By the end of this year, Atom will only reach the GPU level of iPhone 5! (Implementing the SGX544MP2) It's beyond ridiculous!! Nexus 4 has the same GPU. What? Where did you read that? The Nexus 4 and iPhone 5 don't have the same GPU. The iPhone has a PowerVR SGX543MP3 while the Nexus 4 has an Adreno 320. Now why is he an ifan for saying that? What if its actually true, and instead of just running his mouth he did his research. Seems obvious. It's an article about the atom. The iPhone is still an overrated, overpriced phone and has the most inflexible OS. Even with a great CPU and a GPU as the nexus 4 has. On the surface it may look that way. It is hard to tell what exactly this chart is measuring. All phones have different screens, different pixel counts. The i5 is definitely the lower of all these when it comes to screen pixels. This alone may account for the lower power usage versus real CPU power usage. A6 is not the best, it's so deceiving b-c iOS has few features and is very light for the chip to handle. This is what people or iFans always completely forget when talking about Apple iPhone and it's chips. The OS doesn't push the chip so it's obvious it's going to perform better, no multitasking and basically app launcher in a fancy case. Go back and see why the iPhone can claim such great numbers when the OS does very little in comparison to Android at any given moment. Too bad Google didn't try to do the same thing with Android, such as a low power mode which does the Apple version of multitasking, bet those power consumption numbers would rise on Android gear. Who said it's the best chip? It has the best GPU. Having trouble reading? Where's your proof? Any statement that's definitive should b backed up with proof.